Meet Indigo Agnes Kopf « Hercules and the umpire. Indigo Agnes weighed 7.25 pounds and “stood” almost 20 inches tall. She was born at 3:15 PM on Friday, October 17, 2014, Australian time. After Stacey went through 12 hours of very painful labor, and at the last moment, the Aussie doctor had to “turn” Indi from the posterior position to the “right way around.” She was delivered naturally, but with forceps. Mother and baby are doing well. Joan and I are over the moon. Two granddaughters in the space of about one month (Zora–in China– and Indigo–in Australia) is just about the best thing since sliced bread. We can’t wait to see them both. We are trying to figure out how to accomplish that feat given the long distances, but we may have a solution. Thank you. She is a pretty little girl, and we can’t wait to see her. Let’s have lunch soon. All the best. Congratulations on two new granddaughters in one month. With such beautiful new babies, you will need to step up your grampa game big time! Also, Stacey must be quite the super-achiever – having a baby, being a mom and working on her dissertation. So glad to see the photo of Indigo Agnes with Fletcher. 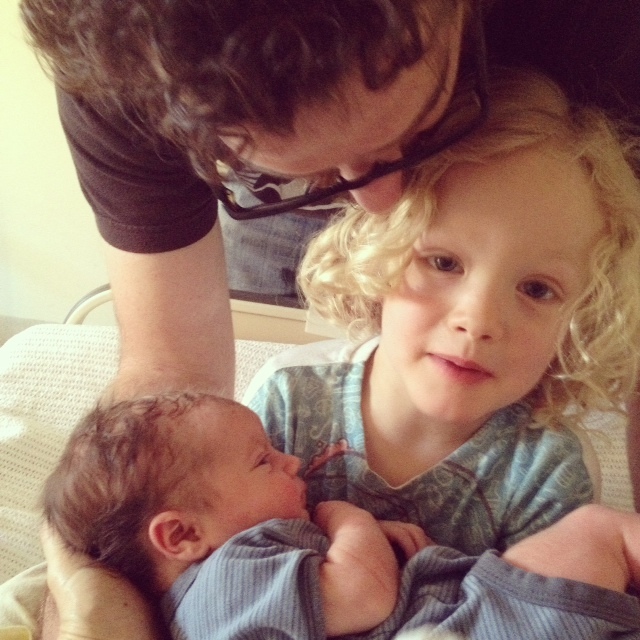 Are you anticipating that Indigo will have the same blond curls as Fletcher? She is gorgeous! Congratulations to all!